Guides in designing a battery with a Vinci EV BMS. Slave to cells For N cells, N+1 voltage tap wires go from the slave to the cells. Cells are divided into banks of up to 25 cells. An adapter is connected to the most positive cell board, one to the most negative. A 2-wire cable goes from the Slave to the positive adapter, one to the negative one. A Linear daisy chain (twisted pair) runs between the Master and the first VinciLink slave; one between each pair of adjacent VinciLink slaves. VinciBus. 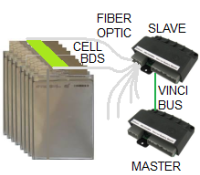 A parallel bus (5-wire) goes from the master, connects each module (slaves and application module), and ends in a terminator.